A nearly year-long fight between the Trump administration and the California state government over school accountability ended with an unexpected twist last week when U.S. Secretary of Education Betsy DeVos (pictured) explicitly endorsed a state student progress metric that reformers had denounced as intentionally vague and misleading. This clears the way for the Golden State to receive about $2.4 billion in federal education aid in 2018-19. The dispute was over California’s formal proposal to meet the rules established in December 2015 when Congress created a new federal education framework to replace 2002’s No Child Left Behind Act, which had fallen into disfavor among Republicans and Democrats alike for linking some federal aid to states to progress in standardized testing. GOP governors denounced the law as an infringement on states’ rights. Democratic governors ripped NCLB for an emphasis on test scores that they said was excessive and and undermined learning. Approved by a landslide bipartisan vote, the NCLB replacement law – the Every Student Succeeds Act – wiped out virtually all federal mandates. But the ESSA law did require states to identify schools which consistently finish in the bottom 5 percent on standardized tests; which have minority subgroups with consistently weak test results; and which graduate fewer than two-thirds of students. Kirst said it was not realistic for California to turn down federal aid, so the state would seek to accommodate the federal law. But he said the California School Dashboard education evaluation program was much preferable to assigning schools a single score. The Dashboard evaluates 10 indicators of educational progress. Some focus specifically on student achievement, including graduation rates, test scores and English learner progress. Several other indicators focus on school district performance with regard to absenteeism, suspensions and “school climate surveys” of students and parents. Reformers have long blasted the Dashboard as being intended to muddle, not clarify, whether districts and schools are broadly helping students’ academic performance. “On the one hand, the idea of having a lot of data to give a more holistic view of how schools are doing can be seen as a positive. But if it’s presented in a way that even if you have a Ph.D. you can’t understand, and you can’t compare school performance and things that one cares about,” that’s unhelpful, EdVoice President Bill Lucia told the Monterey Herald last year. As CalWatchdog reported in December, similar concerns led the U.S. Department of Education to reject the Brown administration’s initial ESSA compliance plan. In a Dec. 21 letter, Jason Botel, principal deputy assistant secretary of education, said California should use more precise measures of student performance. Botel also offered a list of other questions about the state plan. Since then, Botel’s negotiations with the state yielded progress on some of his concerns. The EdSource website reported that on June 29, Botel sent state officials a letter indicating he would recommend that DeVos approve California’s third version of its plan. Botel was pleased with tougher standards offered by the state in evaluating the progress of English-learner students from poor families and in assessing teacher training. 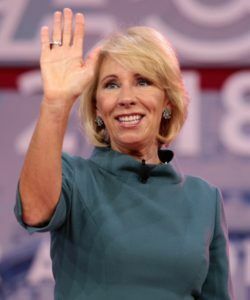 In a July 12 press release, DeVos announced that ESSA plans for California and Utah had been approved, leaving only Florida without a federally endorsed proposal to receive education aid. Beyond the state’s promises to better monitor some categories of student progress, it is unclear why the U.S. Department of Education’s view of the Dashboard’s “holistic,” multistandard approach went from specific criticism in December to specific praise eight months later. EdSource, the education website with many insider sources in Sacramento, depicted the evolution of the state’s ESSA compliance proposals over the past 10 months as reflecting relatively minor concessions. Meanwhile, the state Department of Education’s “Getting to Know the California School Dashboard” explainer website appears unchanged from earlier versions.